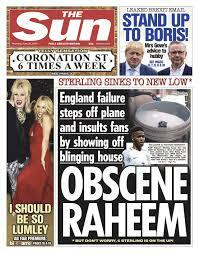 When 21-year-old Raheem Sterling bought his mum a house the Daily Mail was unimpressed. Sterling was the “£180,000-a-week England flop” showing off a “blinging house he bought for his mum… hours after flying home in disgrace from Euro 2016.” Disgrace? Surely the Mail means disappointment at getting knocked out of the tournament only monocular die-hards thought England would win? The 18-year-old’s parents, Phil and Claire, are thought to have been involved in choosing the house and he is determined to keep the close-knit family together despite his emergence as one of England’s outstanding talents. The move is likely to change little for the player who has always lived at home, doesn’t drink and doesn’t yet drive. He takes cash, rather than cards, on nights out and is thought to have taken out a substantial mortgage on the new house. Cash is king – he’s not in the least bit obscene. More in how it different for Raheem Sterling here, here, here and here.